For a deeper understanding of grapevine trunk disease (GTD) in New Zealand, a cheap, rapid, sensitive method for identifying within-vine microbial communities is required. Wood tissue from grapevine trunks was collected and three different DNA extraction methods were compared: a cetyltrimethylammonium bromide (CTAB) method, the Geneaid Plant Genomic DNA Mini Kit and the Qiagen DNeasy Plant Mini Kit. DNA samples from the CTAB and Geneaid methods were used for MiSeq DNA metabarcoding targeting the ribosomal internal transcribed spacer 1 (ITS1) region. DNA produced by the CTAB method was of a greater quantity and quality than for the other two methods, although the majority of the DNA samples provided polymerase chain reaction (PCR) amplification of fungal DNA sequences. 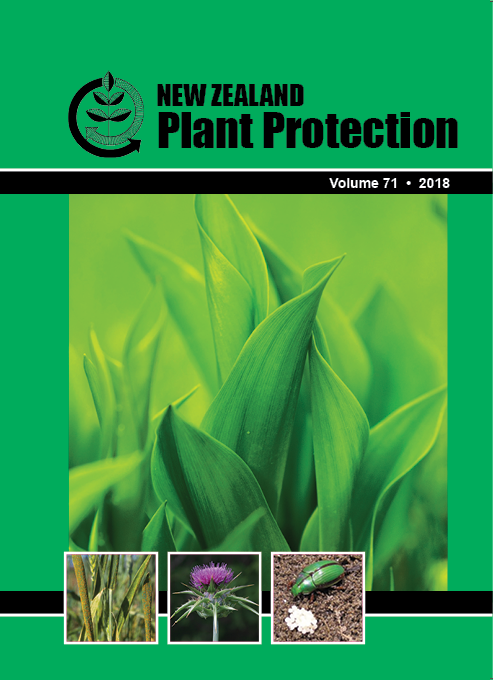 Fungal metabarcoding profiles from the CTAB and Geneaid samples indicated the presence of fungi normally associated with GTD in New Zealand. The CTAB method was chosen for subsequent work due to its low-cost, simplicity and effective detection of typical GTD fungi. The complete process of sampling through to metabarcoding is now used annually as part of a wider ecological study, screening more than 600 vines at 12 Marlborough vineyards.